~ a picture is worth a 1,000 words ... so I'll let it do all the talking! 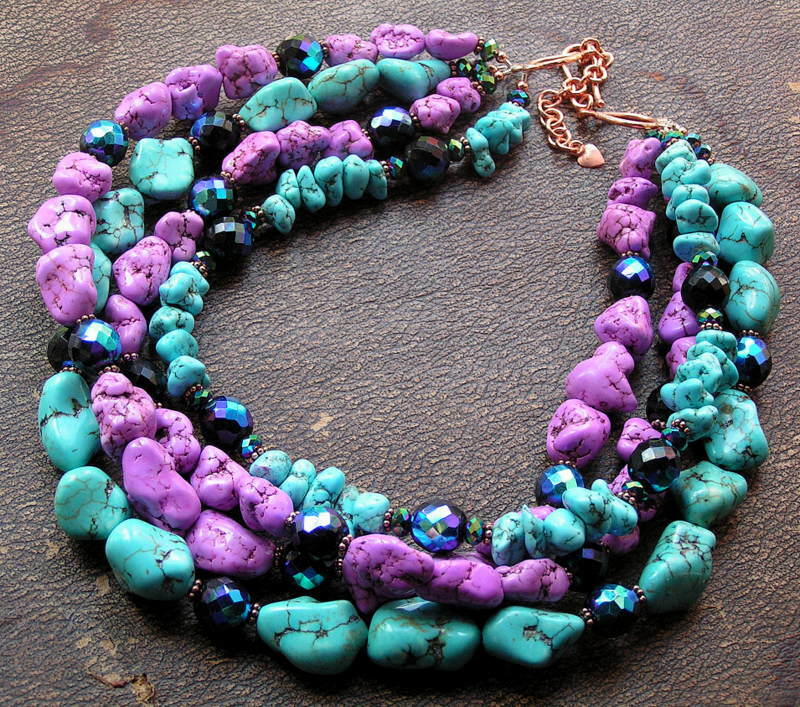 four strands of vibrant freeform chunky nuggets -- shy-blue turquoise and magnesite punctuated with lg peacock faceted AAA grade crystals with oxidized copper daisies...a classic beauty that will serve you well and be a coveted adornment for years to come! 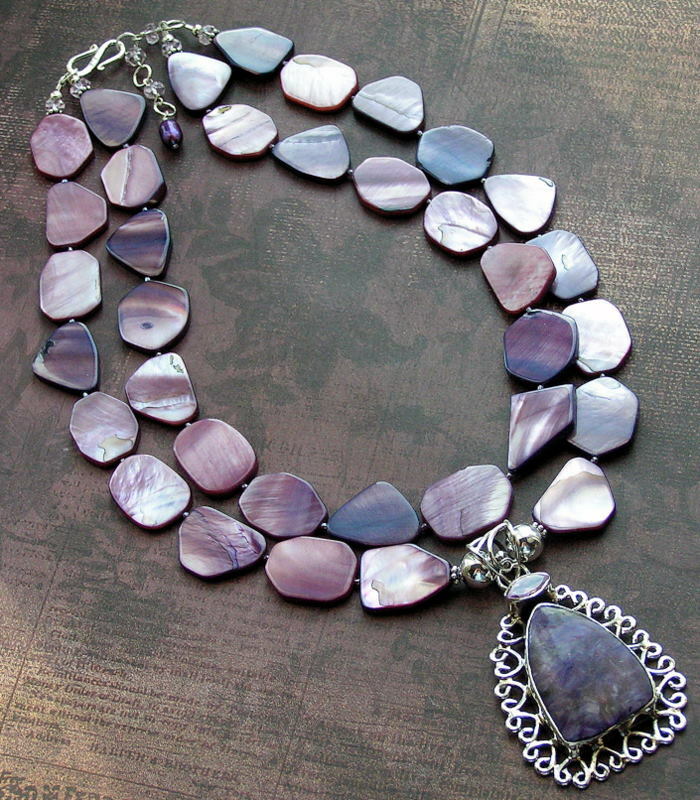 ~ this amethyst is so alluring and a BOLD statement that is sooo pretty!! first, this huge nt JUMBO hand-faceted amethyst stone which is set in a heavy .925 sterling hinged & scroll setting (drop length about 2in x 2 1/2in) it's then surrounded by 3 full strands of highly polished freeform amethyst nuggets, punctuated with hand-cut jumbo crystal rounds & rondell spacers -- the strands so they'll lay one above the other at the neckline for perfect presentation & impact ... these are the last amethyst nuggets i have and a truly one-of-a-kind heirloom pendant that i have ... once it's gone, it's gone!! six strands of gems and pearls such as highly polished london-blue quartz nuggets, freeform natural lapis nuggets, highly polished sodalite rounds, glossy grape amethyst nuggets, glowing purple freshwater tadpole pearls, stacked deep blue lapis nuggets spaced with lg faceted AAA grade crystals...a classic beauty that will serve you well and be a coveted adornment for years to come! ~ a sea of mystical blue waters ... ok, let's try pow!! zing!! bam!! boom!! it's electric blue now playing ... hmmm, i think the word "brilliant" fits best. obviously it is a STRONG blue and it won't wimp out on you ... the pendant is so wonderful -- the vibrant center stone is a tear-shaped blue mystic topaz filled w/a rainbow of colors and encircled by a hand-stamped design in fine .925 sterling (drop length about 2 1/8in) the over-sized bail rests upon all those exrta-large electric blue freshwater pearl nuggets spaced by tiny matching seed beads for add't flexibily, and finally sm sterling spacers finish the ends ... for the true-blue love it will be a wonderful addition to your jewelry wardrobe! 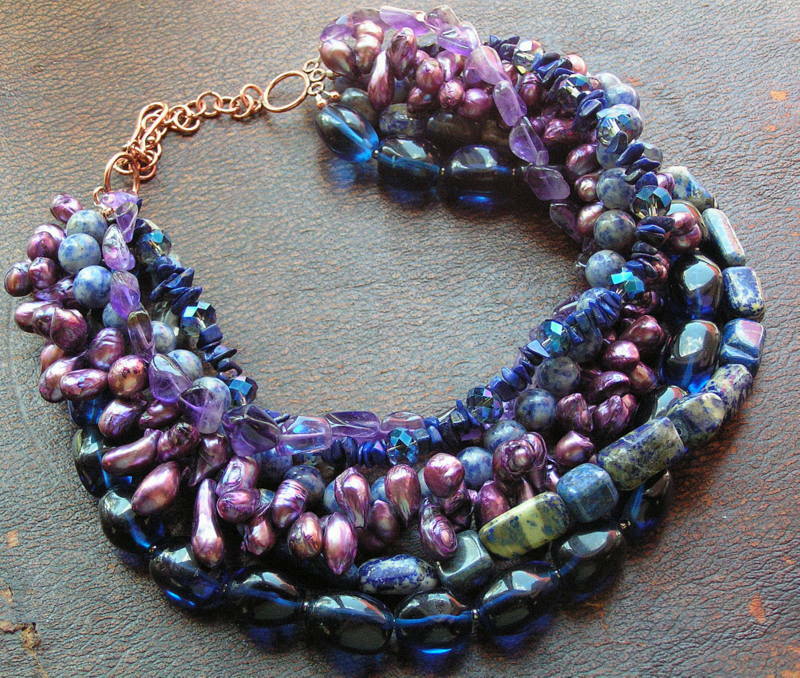 ~ this is a little vixen filled with rich jewel tones to tickle your fancy! ~ take the colors plumb & rose and this is what you get ... a truly stunning one-of-a-kind beauty! a fabulous intricate scroll .925 sterling pendant set w/a lg highly polish rare Russian charoite cabochon accented by a hand-faceted kunzite stone (drop length about 2 1/2in) snuggled up to lg silver rounds & sterling spacers, then i found these wonderful matching and lustrous freeform mother of pearl pressed nuggets spaced by tiny matching seed beads for add't flexibility, finally the ends are gathered and finished w/sm faceted pink crystals & sm sterling beads ... filled with shimmer and shine and much more beautiful in person, i promise! if purple shades are your fav's, you'll simply love this!! this fantastic .925 sterling pendant has an incredible center-piece of highly polished purple turquoise surrounded by hand-faceted amethyst stones (drop length about 2 3/4in) it snuggles up to secure lg silver rounds, hand-faceted pink amethyst & golden citrine rondelles with sm bail sterling spacers, then a full strand of beautiful lg lavender-peacock freshwater pearls spaced by tiny twinkling seed beads for add't flexibility, and finally the ends are finished with sterling melon beads & sm bali spacers....it is a beeeeUtiful piece! ~ these shimmering round rainbows simply don't have an "off" button. just look at all those rainbow colors, each one is soooo beautiful! the pendant is a HUGE highly polished natural labradorite teardrop that's filled w/scads of flashy fiery colors and set in fine .925 sterling (drop length about 2 5/8in), then i surrounded it w/2 full strands of natural peacock freshwater coin pearls spaced by twinkling seed beads for add't flexibility, finally the ends are finished w/sm silver beads ... if you are a peacock pearl fan who loves the rainbows they posess, this will not disappoint. i promise! ~ i tried to match many types of beads to this pendant ... but the only thing you "see" is that ... ~m.e.s.m.e.r.i.z.i.n.g~ oval!! what is it? well, allow me tell you ... this stunning .925 sterling pendant is composed of a very large highly polished Russian charorite ladder cabochon stone and topped w/a beautiful rainbow faceted mystic topaz oval (drop length about 2 1/8in) the side-bails located in the back allow it to move along a full strand of natural hand-faceted grape amethyst cushion cuts spaced by tiny twinkling seed beads for add't flexibilty, finally the ends are finished w/matching crystals and sm sterling spacers ... it delivers a very sophisticated and simplistic look that will compliment and make a wonderful addition to any jewelry wardrobe! 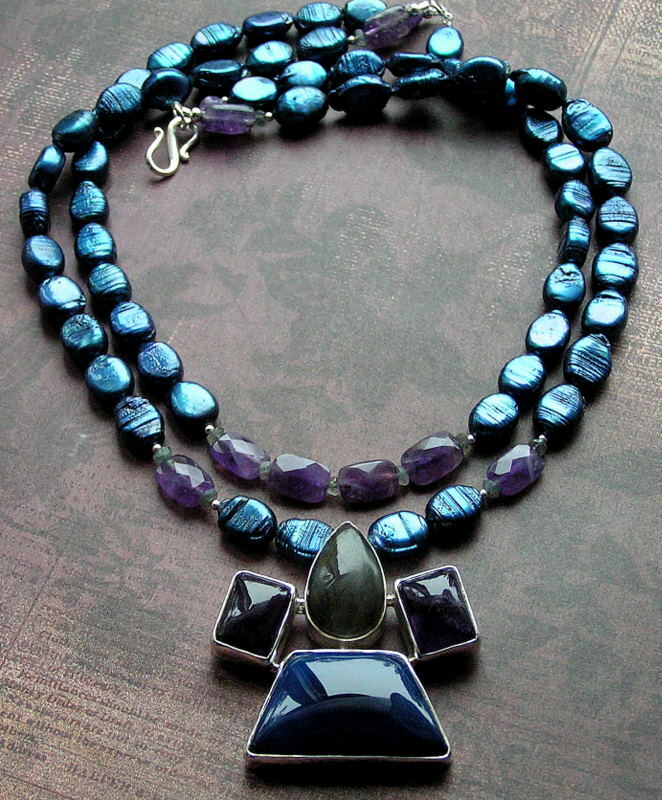 ~ this is a classic color combo -- regal royal purple and vivid sky-blue turquoise ... it appears MANY love the 2 together! first, the fabulous .925 hinged sterling pendant which is set w/the most beautiful sky-blue chrsyocolla teardrop cabochon and topped w/a sparkling grape amethyst oval stone (drop length about 2 1/2in) it glides along effortlessly on a full strand of vivid royal purple freshwater rice pearls and finally finished w/bright turquoise rounds & sm sterling spacers ... it will not disappoint, i promise!